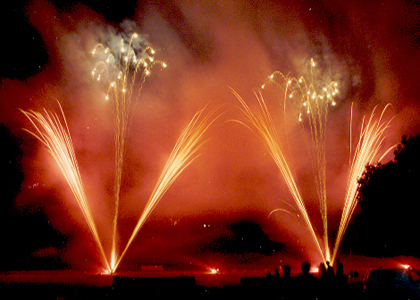 Firework displays can take many forms, from a traditional display with the emphasis on entertainment to an all action spectacular designed to impress with impact! Whatever your event, the Merlin design team will create an original firework display concept designed to suit the occasion, your venue and most importantly, you. Merlin has extensive product knowledge and access to some of the finest fireworks available the world over. Our design team is imaginative and is waiting to go to work for you. Merlin will liaise with you at every stage from initial inquiry to display completion. No two venues are the same and not all fireworks are suitable for all venues so we will visit your venue to assess exactly what may be achieved safely and spectacularly. We will provide a detailed quotation explaining precisely what services and products you will receive, including comprehensive insurance. We will happily advise you on whatever technical and legal requirements may apply. 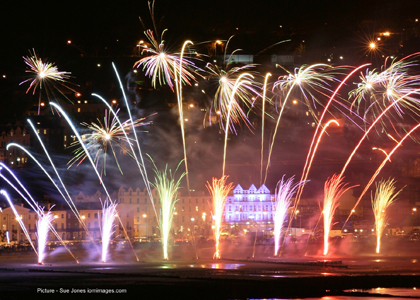 Merlin Fireworks really is the best choice of provider for your firework display. For more information, call freephone 0800 389 1694.